In this Kitchen Nightmares episode, Chef Gordon Ramsay visits Momma Cherri's Soul Food Shack, Brighton, UK, an American Soul Food Restaurant run by Momma Cherri aka Charita Jones that is suffering from a lack of midweek business and the debts are mounting. She has a part time Head Chef/Cook but does most of the cooking herself. Gordon sits down for a meal and eats a Catfish Goujin starter and says it's quite nice and light, for mains he has a "clumsy mess" of soul food, he thinks its phenomenal and clears his plate! Charita does all the prep herself so that she can save money and most of it goes in the freezer. The part time staff seem to turn up whenever they feel like it. (Gordon getting changed into whites). Gordon watches the first service and sees the Chefs just reheating food and plating food and Charita trying to do everything. The next day there is no one at the shack and fresh food left outside. They have a cook out on the beach to promote the restaurant, it goes well and Charita is a natural. Gordon removes Charita from the kitchen and puts her as the host. Gordon does a business cake with Charita to see where she is going wrong. Bookings start to pick up from the earlier beach exercise andbthey are full for relaunch. Gordon comes up with the Soul in a Bowl midweek 3 course menu to help drive sales . Charita toughens up on the staff setting out new rules. The evening was a success making over £1000. Gordon gives Brian a man to man talk before leaving. Gordon revisited and Momma Cherri's had moved into a much larger restaurant Momma Cherri's Big House. Although fully booked far in advance, he Chefs were struggling and the food had gone back to frozen and passionless food. 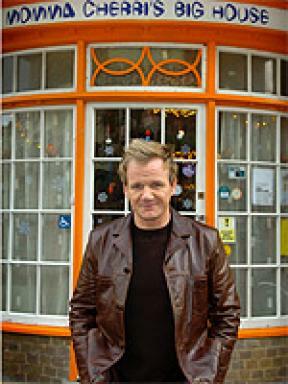 Both Gordon and the customers were disappointed with the food, saying they would not return. Gordon stays an extra week to help them sort out the problems. In 2007 Charita released her cookbook "Momma Cherri's Soul in a Bowl Cookbook" and Head Chef Brian also left in 2007 to focus on art projects. In July 2007 the restaurant was inspected and scored 0 stars in the food hygiene ratings. In 2009 the restaurant closed with large debts and went into administration. Charita opened Momma Cherris Speakeasy in Brighton but this closed after just two months. Charita has made many television appearances on cookery programmes including This Morning on ITV, Market Kitchen on the Good Food Channel and more gaining her the "title" of a celebrity chef. Momma Cherri has a Youtube Channel, with recipes and more. In March 2015, a restaurant Caribsoul opened in Croydon serving Momma Cherri's recipes and Trip Advisor reviews were excellent but the restaurant closed in October 2017. Chef Brian Moyo opened restaurant SoulFoo Food Bar in Brighton with his brother Aaron and Trip Advisor reviews were excellent. Momma Cherri made appearances in the kitchen but they closed the restaurant in April 2018 to focus on Bad Boys, a takeaway burger business. Momma Cherri's Soul Food Shack aired on June 07 2005, the episode was filmed in 2004 and is Ramsay's Kitchen Nightmares UK season 2 episode 3. No one to blame but herslef. One of the best episodes. I just love Momma's very warm character. The fact that she was underpaying herself broke my heart. Only real honest people do that, and she belongs in the soul food. I might even consider buying her book! Still the only episode from either country where Ramsay largely enjoys his initial meal? Indeed. Never seen him finish a plate, or even most of it. Seems like Charita got greedy. Chef Brian became an Art student? A real shame although unfortunately the writing was on the wall from the start. Unlike most other places the food was not the problem here it was that Charita had a poor head for business. After her initial spike in popularity she over-expanded by moving to larger premises and this proved to be her undoing. I recent watched the episodes. I am very disappointed to read the bad news. The food was great. Gordon loved the food. I was surprised to see him enjoy the first plate. However, Charita poorly ran her business. Not surprised it closed. She was not listening to a word Chef Gordon said. It was all yes yes .....hearing Chef but not listening.No humility whatsoever. Apparently she thought she had all the answers. An all too common affliction. I'm surprised that Ramsy wasted his time with her and a few others that have appeared on KN. Don't be ridiculous. She listened to Gordon and still speaks well of him. She just expanded too much and wasn't good at business. Probably needs someone to help her with that. Gordon spent time on her cuz she was WORTH IT. And of most of the people on this show, she really deserved it. Go back to observing, cuz clearly u can't do it properly and it's better to just do that than speak ur mind and spread lies and misinformation. I think she was set up for success in the original Shack, but over-reached with non-existent capital to get a lease on that HUGE building, cut corners on the food and down she went. What a pity. Gordon should have just fixed the staff. She was fine and didn't need to change. I think Gordon messed up on this one. One of my favourites on the re-watch so far. So good to see Gordon revitalise these people - sometimes we just need a good kick in the a! A real shame Charita overshot her mark - this stuff was way ahead of it's time. Sad to see it has closed. Would have loved to go there some day and maybe meet the staff too. It seemed like Charita Jones was a great cook but a bad manager. I think she would have been much more successful if instead of a restaurant she had opened a food truck or hawker stand. It would have been a smaller space to manage and she could have operated it without a full staff, only one or two employees or her husband. And she probably would have been much more profitable too. I will always remember this episode as Gordon actually liked the food before he made any changes, which is rare. Pity she closed as she had all the tools and knowledge to make it work. She's now on YouTube, and still talks glowingly about Gordon apparently. She's obviously the creative type who can't run a business on her own. She's full of ideas and talent but doesn't know how to organize, deal with finances, managing employees etc. That kind of person needs someone to take care of that side of the business, so he/she can focus on the concept.